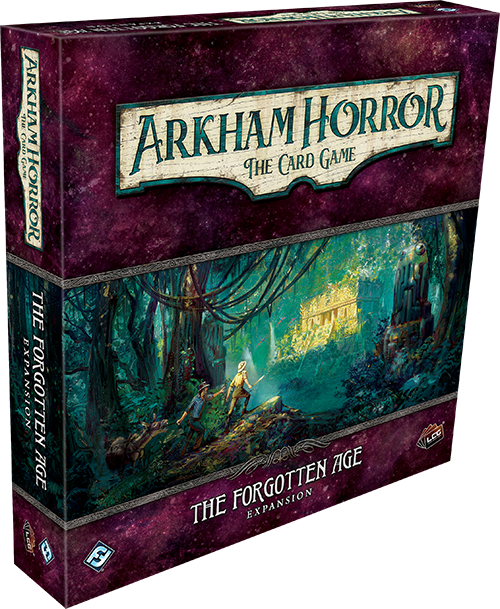 Fantasy Flight Games is proud to announce the upcoming release of The Forgotten Age, a new deluxe expansion for Arkham Horror: The Card Game—now available for pre-order at your local retailer or on our website here! 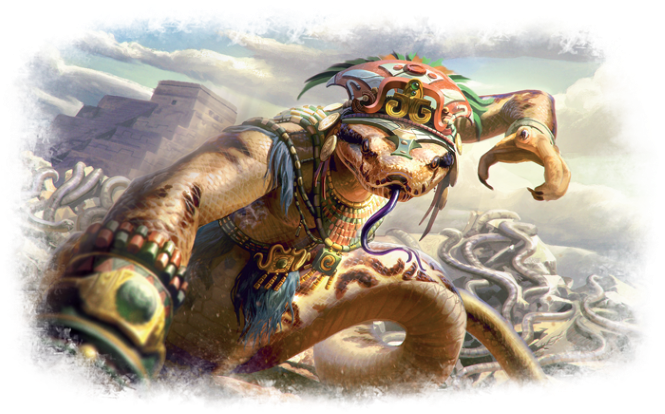 The first of the scenarios included in The Forgotten Age, The Untamed Wilds, throws you into the middle of your scientific expedition where your team of investigators has ventured far into the rainforests of southern Mexico in search of a forgotten Aztec city-state. Today, you depart from your camp in order to find the ruins Alejandro seeks. There is no telling what you may encounter beneath the thick jungle canopy, but you have come too far to turn back now. 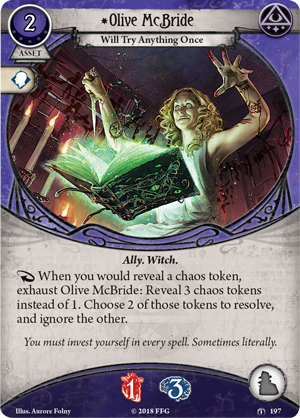 In keeping with the new feel of your investigations, The Forgotten Age introduces the new Explore ability that you can initiate with an “activate” action, as seen on Agenda 1a. 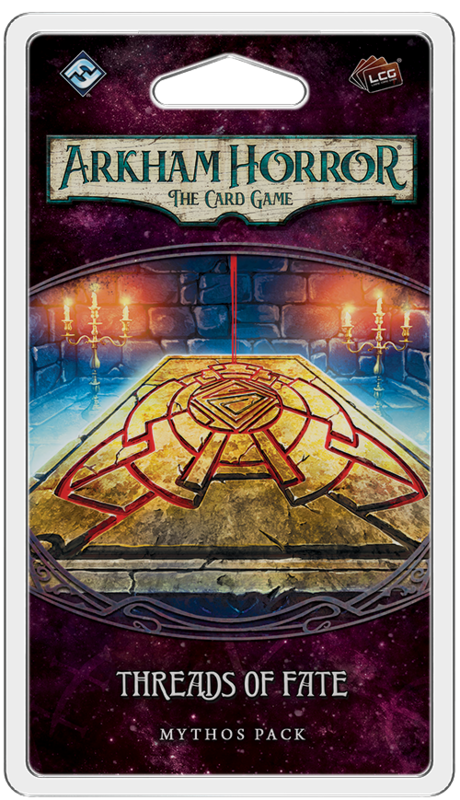 These abilities instruct you to draw the top card of the new, separate “exploration deck” which is filled with single-sided locations and treachery cards. 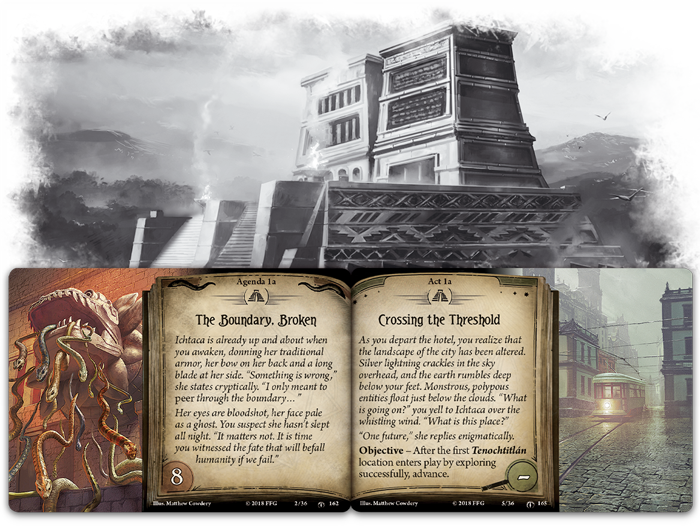 Each Explore ability indicates a particular type of location that you are seeking to draw and, as a driven investigator, you must continue to draw from the exploration deck until you either discover the location you seek or a treachery brings your exploration to a halt. If a location of the type you seek is drawn, it is put into play and you move to that location to successfully tour the area. For example, Agenda 1a instructs an investigator that their exploration is currently searching for a connecting location. 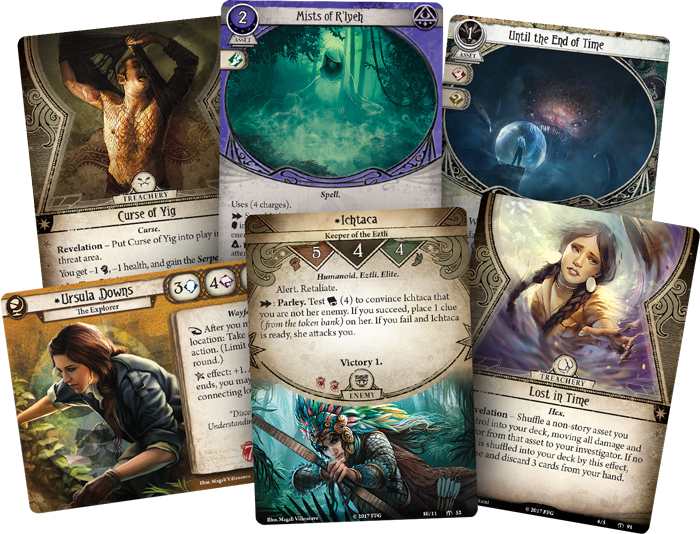 Ursula Downs, currently at the Expedition Camp (The Forgotten Age, 50), spends her first action to explore and draws Circuitous Trail (The Forgotten Age, 73), which is not connected to the Expedition Camp. 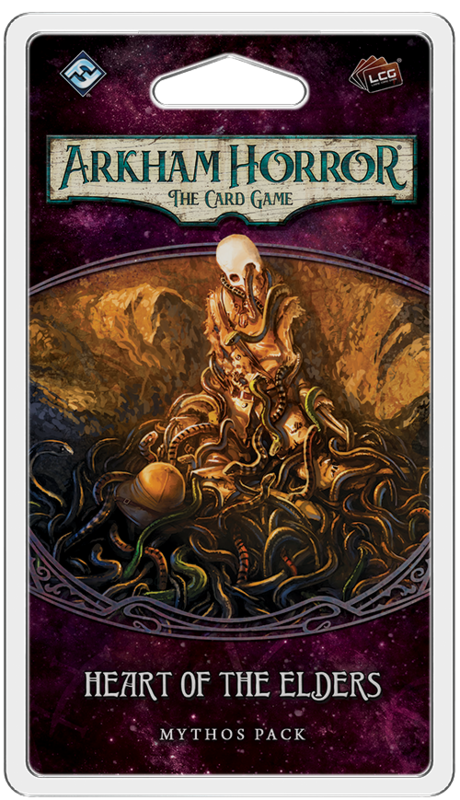 This card is therefore placed beside the exploration deck and Ursula draws again, revealing Low on Supplies (The Forgotten Age, 82). 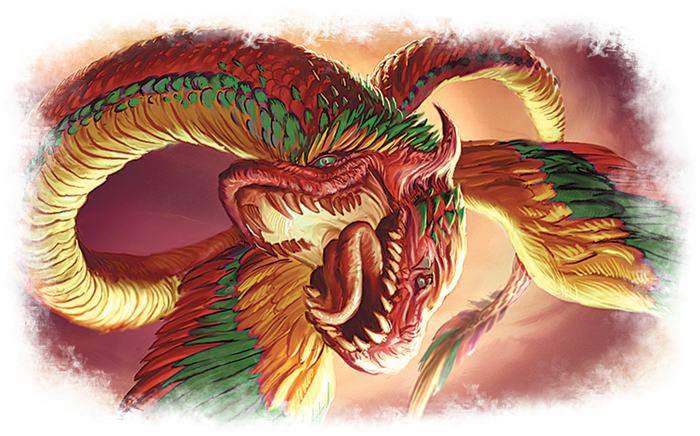 As this is a treachery card, she must resolve the card’s effects and her exploration ends unsuccessfully with Circuitous Trail reshuffled into the exploration deck. In the diagram above, Ursula reveals a location that does not connect to her current location. A treachery card ends her exploration attempt. 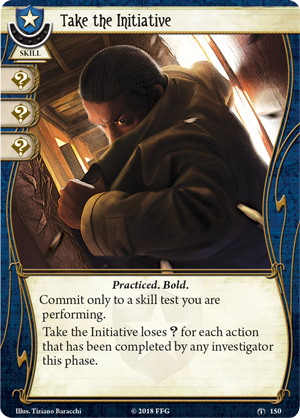 However, a failed exploration does not necessarily indicate the end of the investigator’s turn. 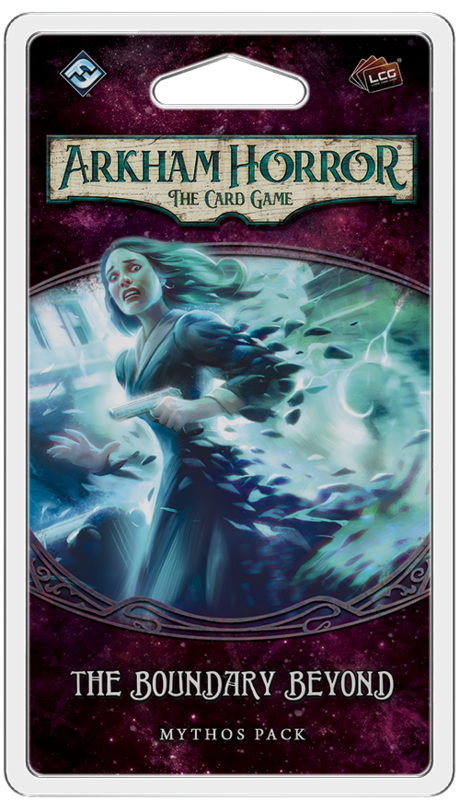 A single setback is not enough to stop the determined investigators of Arkham Horror: The Card Game. As her second action, Ursula decides to explore again. 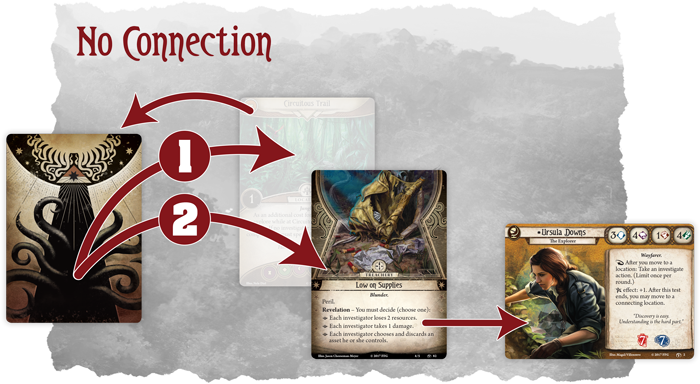 This time, she draws Path of Thorns (The Forgotten Age, 69), which is connected to the Expedition Camp. Therefore, her exploration is successful, Path of Thorns is put into play, and Ursula immediately moves there. On her second attempt, Ursula discovers a connecting location! She puts it into play and immediately moves there. 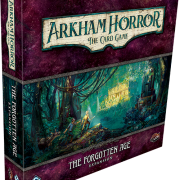 The Forgotten Age draws five new investigators into the maddening realm of Arkham Horror: The Card Game as they search for answers among strange ruins from a bygone era. 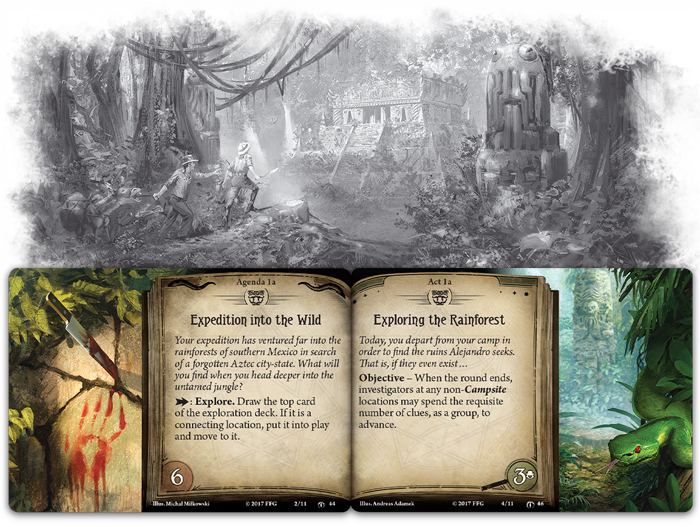 Among these brave investigators is the explorer, Ursula Downs (The Forgotten Age, 2). Ever since Ursula was a small girl, she has broken every rule set down for her: climbing trees, playing in mud, exploring the woods, and plenty of other things ill-considered for the behavior of a proper young lady. Since earning her degree in archaeology in Boston, she has traveled the world in search of forgotten civilizations and has continued to prove herself among her peers as a woman in a male-dominated profession. Ursula knows that discovery is easy. Understanding is the hard part. 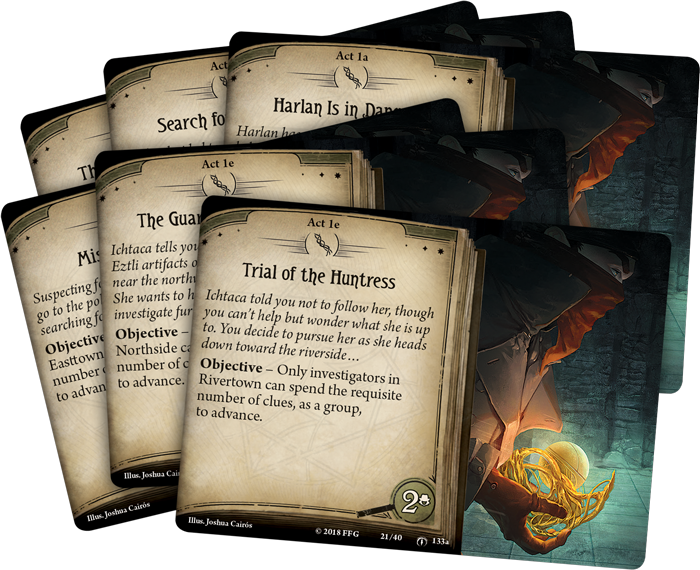 As an investigator, she believes in brain over brawn with an intellect of four and a combat of only one. This explorer is, however, incredibly quick on her feet with an agility of four. After all, to live a life as exciting as Ursula’s, you have to be quick on your feet if you’re not interested in fighting. No matter which continent you find yourself on, no matter what dangers you find yourself pitted against, when you play as Ursula Downs, there is always at least one person you can trust. Ursula’s close friend Jake Williams (The Forgotten Age, 8) will always have her back. 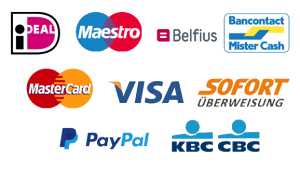 When this loyal companion is in play, the first move or investigate action you perform does not provoke attacks of opportunity. 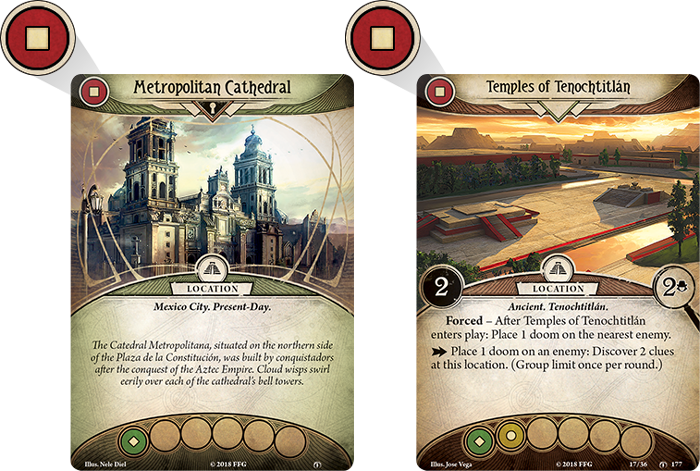 What’s more, you can take advantage of Jake’s own insights into the new locations that you discover. 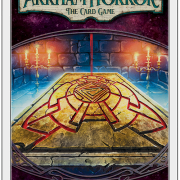 After you reveal a new location or put one into play, you may exhaust Jake Williams to draw a card. 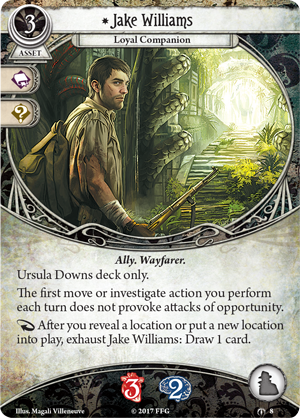 Combined with The Forgotten Age’s new Explore action, Jake will prove an invaluable Ally, and make Ursula more powerful than ever. Ursula’s driven nature and natural curiosity make her a skilled explorer, but at times her passion borders on obsession as she is tormented by the Call of the Unknown (The Forgotten Age, 9). When this weakness comes into play, Ursula must choose a location other than the one where she is currently located. 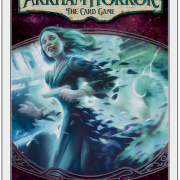 If she does not successfully investigate that location before the end of her turn, she suffers two horror and must shuffle Call of the Unknown back into her deck. The only way that this investigator can break free of her obsession is to finally understand the riddles that each new discovery presents her with. 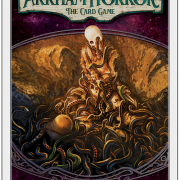 Do you have the courage to join Ursula in her pursuit of knowledge and the fortitude to survive, or will you become one of the countless souls claimed by the mysteries lost to time? 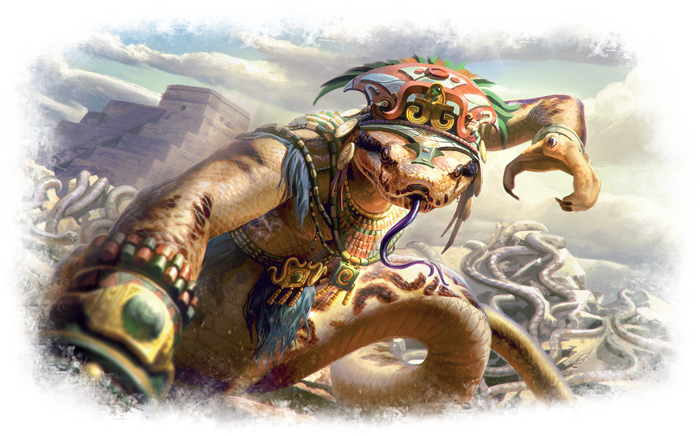 Embark on a new adventure. 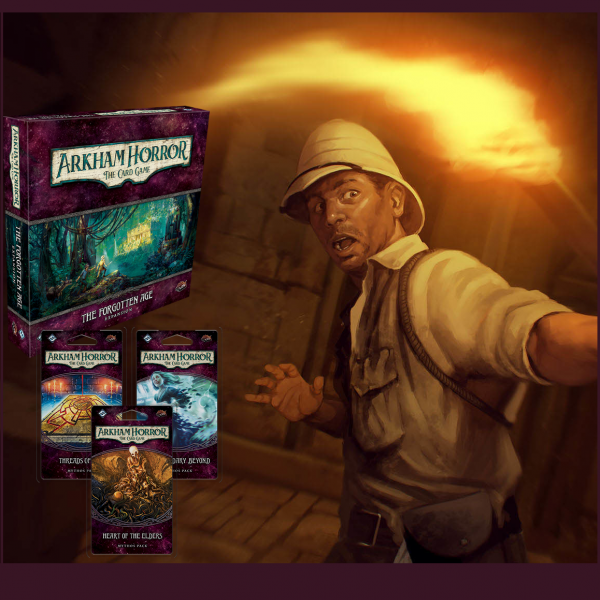 Make the discovery of a lifetime, unravel the terrifying eldritch mystery, and learn the secrets of The Forgotten Age!